I like to read about all sorts of technical things. In fact I have to as part of my career as an IT Manager. When you read some sites, the nature of the web tends to get you onto other sites that will interest you. I'm always up for a cooking challenge so I looked at the recipe and said OK Lets Try This! If you follow their instructions, you will end up with a loaf of bread that is simply amazing and amazingly simple. Ciabatta Bread is what you get when you have a Panini and it is full of big holes and "nooks and crannies" that toast up well with melted butter, whether mine or someone else's. Here was what I got when I followed the recipe. It turned out perfectly. Next time I'll bake it another minute or two, but I have an oven that has only a passing acquaintance to the correct temperature so I'll blame it on my equipment! LOL! and 1 teaspoon of sugar. Slosh all that around for a little bit. Now go add to this the rest of the ingredients: 4 cups of bread or all purpose flour. Oh you're done. Mix this stuff until its a batter. Their directions said that it would be like a thick pancake batter. I found that it was a bit like a biscuit dough that was dry. Looser than usual for bread dough. It also reminded me of play-doh. I suspect that the weather will have an effect on this one. Now you need to put this in a warm place for 8 to 12 hours until it doubles in size. I warmed my oven to 100 or 105, slipped the bowl in there, and walked away until the next morning. The next morning, I dusted the cookie sheet with Corn Meal, you could use butter or flour... your choice. I then poured this sticky batter out onto the sheet, dusted it with flour, and popped it into a 400F oven for 25 minutes. 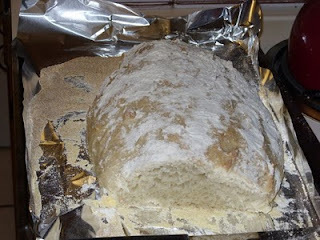 Next time I do this, I'll leave the dusting of the flour off the top of the loaf as it was unnecessary and I will bake it a little longer since the oven is so inaccurate. The recipe is SO simple you will end up scratching your head "Am I really DONE?"! I'm going to send this to my Godmother who insists she can't bake (I am corrupting her and now she makes my 3 ingredient fudge recipe) and see what she thinks. Even you can bake bread!